In my last post, I referred to N.Y. Senator Chuck Schumer's bill in the Senate- the Fix Gun Checks Act of 2011, S. 436. One of my commenters pointed out that even the Brady Campaign's President, Paul Helmke appeared to have some problems with that bill and gave me a quote from Helmke. Here it is: " “It’s a concern we’ve raised about this proposal, too. I’ve got the same concerns,” said Paul Helmke, president of the Brady Campaign. “[There is] the whole innocent-until-proven-guilty concept coming into play here. So that alone is a legitimate concern.”" Though the commenter did not provide a link or a context for these remarks, I have learned that Helmke's comments appeared in the on-line Daily Caller. The comments made by Helmke are correct. The commenter is right in that the Senate version of the Fix Gun Checks Act has some areas of concern raised by the gun lobby as well as by those on the side of gun control. A similar bill, HR 1781 was introduced in the House on May 5th by N.Y. Representative Carolyn McCarthy. Here are the changes made to the House version to address the concerns about the Senate version. 1. The language in Section 104 of the Senate bill dealing with drug abusers was deleted. The only part left in the House version is the language that clarifies the Federal Departments and Agencies referred to in the Brady Law that include federal courts. 2. The language to define those adjudicated as a mental defective was cleaned up by writing the regulatory definition into the bill and the expanded language from the Schumer bill was included here. 3. The permit loophole was closed by requiring permit holders who want to avoid a background check to present their permit to law enforcement or a licensed dealer to confirm the validity of the permit before a sale can go through. 4. The House bill requires a GAO study on the implementation of the NICS Improvement Amendments Act, which includes challenges faced at the state level to implement the law. 5. The House bill delays the implementation of the enhanced penalties until 1 year after Congress receives the GAO report. As we all know, bills are written and proposed with language that is not always as clear and concise as originally intended. Such was the case of the recent gun bills in Minnesota, to which I have referred in previous posts. Many changes were made to that bill but it was still left with some vague and poorly written language that even the sponsors of the bill could not explain or understand. Changes are often made as a bill makes its' way through committees and during public hearings. Depending on co-sponsors and if and when the bills are heard in either or both chambers, more changes will likely occur. This is a bill that deserves to pass as it fixes loopholes in current law that allow for the sale of guns to people who clearly should not be able to purchase guns. The changes made to the House version cleared up some problems with the Senate version and the sausage making will deal with the compromise when the bill gets to Conference committee if passed in both chambers. · Protect the sensitive information providing the basis for terrorist watch lists." This article by Cliff Schecter is a good analysis of why we need this bill to pass. If we believe what this article says about the potential for a terrorist attack with the use of guns, then we should pass this bill. The bill was first proposed in 2007 with the support of Republican President George W. Bush. It should have the support of both parties if they care about keeping terrorists from making another attack on our own soil. The gun lobby should support this bill but doesn't. There are safeguards built into the bill to keep people who are wrongly denied a gun purchase to challenge. In this case, the negative rhetoric obscures the benefits of the legislation. Even most gun owners favor passing the bill. 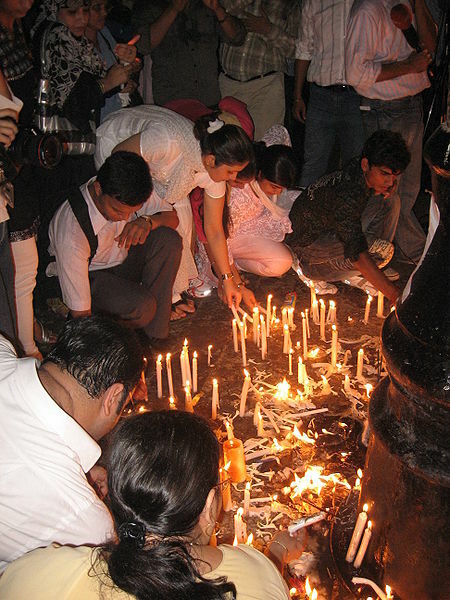 It would be wise for us to remember the terrorists with guns who paralyzed the city of Mumbai, India for 3 days in 2008, killing 164 people. Passing a law to stop known terrorists from legally buying guns just makes common sense, as does the Fix Gun Checks bill. Let's get to it. Japete, sorry for not posting my source of Helmke’s quote- I meant to. I haven’t read McCarthy’s bill yet, but it sounds better than Schumer’s. Still, her solution to private sales is to ban them, rather than provide the means for conducting background checks, just as Schumer’s does. I am not keen on the idea of university Witch Hunt panels looking for crazy students either. McCarthy’s draft bill is exactly like Schumer’s most recent senate bill, however, in that it offers general prohibitions against any “unlicensed transferor.” Gun shows are not specifically mentioned in either the bill but it essentially means anyone who is not a licensed firearms dealer or any agent of the state capable of conducting immediate background checks. Read: private sales are banned. Your explanation does not satisfy this question. You are saying rights will be taken away, but there are safeguards to have them restored. That is a little different than not taking away rights of the innocent in the first place. And how do you interpret this line? This is an AND condition to being on the watchlist. This seems to be overlooked when proponents think they can deny everyone on the watchlist from buying guns- either that or I am totally misinterpreting it. Still, I would not call it proper due process because the check does not leave the DOJ’s office. It should be a judge that reviews the evidence, and yes, there should be actual evidence that a particular individual is plotting a terrorist attack (not just a name), and it should be temporary. The AG’s office can bring the evidence back to the judge to sign off again if necessary. I think that is reasonable, do you, Japete? "Passing a law to stop known terrorists from legally buying guns just makes common sense,"
Can you please explain why it just makes common sense to allow "known terrorists" to remain free, free to buy fertilizer and diesel, free to buy machine shop tools that can be used to make guns, free to buy guns on the black market, free to manufacture purchase import and or steal any weapon or weapons that they so desire? Can you please explain that? Why are these people so dangerous they can't buy a .22 but they aren't so dangerous as to require their being immediately arrested and prevented from being out and about in the public? This isn't a "Terror Gap bill" - this is a "Keep the Terrorists on the Street Bill". "It would be wise for us to remember the terrorists with guns who paralyzed the city of Mumbai, India for 3 days in 2008, killing 164 people. Passing a law to stop known terrorists from legally buying guns just makes common sense, as does the Fix Gun Checks bill." What does the Mumbai attack have to do with terorrists potentially getting weapons in the United States? The attackers in the Mumbai attacks infiltrated India, with their weapons, from Pakistan - they were not acquired within India. I don't at all see the connection - what are you trying to say with this? Not sure I get your point Critical Thinker. I think that flags are raised when someone buys a lot of fertilizer at one time. I do think there is a difference between people who are on the terror watch list buying guns and those buying machine shop tools. Since there is not a background check system for tools, I suppose those folks can slip through the cracks. But since we do have an actual system to stop prohibitied people from buying guns, why not extend it to known terrorists? Yes, of course, they can and likely do buy guns on the black market. They also buy them at gun shows from private sellers where no background check is required. The day before the 9-11 terror attacks, several Hezbollah members were convicted of buying guns from a Michigan gun show dealer for who knows what? Again, did I says we could stop all terror attacks? But sure as heck should try given that we already have a system in place and that we have an example of how terrorists can attack cities using guns? Home grown terrorists can do the same- see the D.C. Sniper case as an example. Those guns came from a gun dealer in Tacoma, Washington who didn't report hundreds of stolen guns to the ATF. I assume the federal government trying to monitor activities of people who are suspect. I believe that several Iraqi people were just arrested for suspect activities in a city in Kentucky where they lived. As you probably know, but you just want to be provacative, Bryan, the Mumbai attacks are an example of what terrorists can do to a major city with guns and explosives. If it can happen there, it could happen here. Why not try to stop something like that before it happens again? Isn't that why we have scanners at airports and we have to take off our shoes, etc.? We know that terrorists used planes for one attack so we try to stop another like it. We know what happened in Mumbai, we should try to stop another one like it. If these people are known terrorists, surely there is some crime they can be charged with, right? Charge them, give them a fair trial, and then if convicted they'll be barred like any other felon from purchasing guns. What bothers us is that the system you're supporting lacks due process, which is supposed to be the foundation of our justice system. Having some remedy to get off the secret list isn't good enough, people should not be punished or restricted in any manner without concrete evidence and a trial. Mere accusations shouldn't do it. If you're on this list for a real reason, then whatever evidence they have should be enough for a trial. You can't lock people up or take any other rights because they 'look dirty'. One of the main reasons the Mumbai attacks succeeded was that the police refused to defend the UNARMED populace, even when citizens entreated them to shoot the terrorists. Really, Cargo? What's your evidence for that? The reports coming from Mumbai. Indians were on camera stating that the police would not shoot back, hiding when a terrorist would be in the open. Indians have lost their culture of self defense. The British disarmed them. Indians were telling cops, "Give me the gun. I will shoot the terrorists!" Similar results happened in Israel before the liberalization of civilian carry. Palestinian terrorists would open up with automatic weapons. When citizenry would start shooting back, that kind of attack stopped. "Really, Cargo? What's your evidence for that? " "Since the attacks in November, many questions have been raised about how Mumbai's police force of 42,000 failed to present any meaningful challenge to 10 terrorists with assault rifles and grenades." "As you probably know, but you just want to be provacative, Bryan, the Mumbai attacks are an example of what terrorists can do to a major city with guns and explosives. If it can happen there, it could happen here"
I'm not trying to be provocative, I was trying to understand the connection and your point of view on this issue. And questioning a connection that I just don't see in my head. I am highly critical of allowing a subjective "list" to be used to block individuals from exercising their constitutional right to keep and bear arms. There would need to be some legislatively defined due process provisions in place - I am not interested in leaving that up to the DOJ to implement via rulemaking. Cargo- again- find me a link to some factual information that shows this to be true. Thanks, Bryan, for providing an actual story. It sounds like police were unprepared as many would be in cases like this where surprise attacks happen. I found this to be interesting, " India's police force hasn't expanded to match its vast population. The number of police per 100,000 people has slipped to 125 today from 134 in 1996, according to India's National Crime Record Bureau. That compares with a global average of more than 200 per 100,000 people, experts say. Most police work 12-hour shifts, six days a week, for which they make less than $200 a month. The vast majority are armed only with bamboo sticks called lathis." I know your solution would be to provide more guns and it sounds as if the police force there does not have the weaponry needed for such an attack as the one that happened. But there are also some incidents of bravery of the police officers who stopped some of the attackers or shot them. These, of course, are allegations and "Monday morning quarterbacking" as always happens after horror stories like this one. Could they have been stopped? Could the 9/11 terrorists have been stopped? It is not possible to stop all of these attacks nor have I said they could be. But looking back, one can see things that could have been done differently or better. Or incidents such as this one provide us with ideas for how to prevent another one. They could, of course, try something else. Sort of like the "shoe bomber" on the flight from London. Box cutters wouldn't work so they thought using a shoe as an explosive device would work. Now we have to take off our shoes at airports to stop something like that from happening. So making sure known terrorists don't buy guns legally from FFLS would be a start towards preventing what happened in Mumbai. It won't solve the problem completely but why not try? While I (sort of) understand your concern, japete, please understand ours. What the bill essentially authorizes the gov't to do is create a secret list which would deprive persons of a fundamental right, based upon secret evidence that a person cannot see or challenge, all on the mere word of a political appointee. Gosh - what could go wrong? Only after the fact would the accused be able to challenge this list - and since the bill apparantly is designed to "protect the sensitive information providing the basis for terrorist watch lists," the accused will likely not have the ability to challenge that information. Moreover, such a procedure shifts the burden of proof to the accused, requiring one to "prove" themselves innocent. When a fundamental right is to be taken away, the burden should rest firmly on the State to justify why. Imagine having to prove yourself innocent before being permitted to publish this blog, japete. You would not accept that at all, and for good reason. But that is exactly what you are asking gun owners, 99.99% of whom have committed no crimes whatsoever, of accepting. Anyone committed to civil liberties should, and would, object to such a procedure. No. Hell no. To paraphrase Franklin, those who purchase security at the price of liberty will end up with neither. I'm with Pyrotech85: if they've committed a crime, arrest them, put them on trial, and then bar firearms. THAT's due process. What you seek is not. We do no punish persons for what they might do in America. Not in an America I want to live in. What is the secret list to which you refer, anon? By “flags” do you mean added to the terrorist watchlist? Farmers have a need to buy lots and lots of fertilizer at one time so flagging them as terrorists isn't going to do any good. I know you don’t like it when we bug you for answers to our questions, but do you think what I proposed in the first comment of this thread is acceptable due process. Those *known* terrorists you site will all be denied gun purchases under my proposal. The Terrorist Watch List ( which is not the same as the No Fly List) is a secret list. No one wants a terrorist to buy guns. But being on a watch list is NOT the same as being a terrorist. Either deport, arrest or charge the people on the list. Otherwise, no matter what we might "think" they are up to they are still entitled to due process under the constitution. Think about the people in Gitmo that the left was going crazy about them being held without being charged. Do you support them being held there indefinitely or do you think they should be charged and tried or released? The list is the same problem (worse actually) . Putting a CITIZEN on a "LIST" then denying them their Constitutionally protected rights without being charged or tried is "Guilty until proven Innocent"
We reject that out of hand in this country. Or at least we should. The question thing- it's because you guys ask rhetorical or unanswerable questions often. Or you ask questions that I really don't have answers for or I choose not to answer because my answers will fly all over the blogoshpere. Sometimes people ask me specific policy questions that I can't answer because I am not a lawmaker and only one person blogging. And sometimes the questions are just plain provacative to elicit an answer to a loaded question that you all know the answer to and you just want me to "bite". My question was none of those things, Japete. I certainly hope you don’t see it that way. All I am asking is if you think that is a fair way to go about it and if it satisfies your goal of prohibiting known terrorists from buying guns from an FFL. The safeguards I am asking for are the same as if authorities want to get a warrant to search the suspect’s dwelling, or tap their phone line- so there is a precedent. TS- do you know for sure that those safe guards will not be in this bill? Do you think that Senator Lautenberg and those who support this measure are trying to take guns away from law abiding citizens and that they are doing this for kicks to go after gun owners? Senator Lautenberg has true concerns that terrorists are buying guns right under our noses from FFLs and we can't stop them. Does that sound right to you? Surely we can fix this situation and it won't be to your detriment. Yes, I understand the invasion of privacy concerns. I have them, too. I am not a big fan of some of the provisions of the Patriot Act either. Does it make sense that the government can look at what you are reading from the library but they can't stop a terrorist from getting a gun? We seem to have put up with a lot of provisions to "keep us safer" since 9/11. Why should this one be different? I know from my work that precursor chemicals used in drug manufacture bought in quantity raise signals that will warrant a visit from LEO. Likewise, if he has tried buying decongestants (e.g.,pseudoephedrine) OTC he would know that they need to be purchased from (a) a pharmacist and (B) with a show of ID. I can't imagine that precursor chemicals used for explosives are easy to buy. In fact, I am pretty certain that taggents have been added to those chemicals post Oklahoma City. Sort of makes sense if precursor chemicals for drugs are regulated--doesn't it, Mr. Critical Thinker. While firearms could be built in a machineshop--why bother when they are readily available from commercial sources. Nice diversionary tactic, but it fails miserably. "Do you think that Senator Lautenberg and those who support this measure are trying to take guns away from law abiding citizens..."
I know those safeguards are not there now because I read the bill. The important thing is for a judge to sign off for each individual case and that it is temporary. There are some safeguards in the current bill, but the thing that gets me is that they are seemingly ignored by you, the Brady Campaign, and the author of the bill. You can’t deny the whole watchlist with the criteria “reasonably believes the person…” as one of the criteria. “Reasonable belief” means something. “The person” means something- as in an individual, not just a name. But what we keep hearing is that this bill is going to instantly make all names on the existing terrorist watchlist prohibited people, and that is never going to be acceptable. My advice is to drop all talk of the “watchlist” or “no-fly list”- in fact drop the word “list” altogether. The bill can be marketed as solving situations where there is enough evidence to believe someone is plotting a terrorist attack, but there is not enough evidence for an arrest. Law enforcement can take that evidence to a judge to order an injunction to have that person added to the NICS denial and set an expiration time. The reason why it is imperative it goes through a judge is because rights are going to be suspended. It wouldn’t be much of a check if law enforcement got to issue their own search warrants based on their own evidence. That is the way Lautenberg’s bill is currently worded. So as long as there is evidence, they’ll get to bar all the known terrorists you want. The difference is that it might be dozens of people instead of a million- but they’ll actually be terrorists. Can you live with that? Just one more thing, I never expected that this legislation would affect me personally. Call it altruistic, or standing up for freedom and what is right. And I have never supported the Patriot Act. If you ban firearms (or magazines, bullets, shootings, bad people) without addressing the root causes of crime, they'll go homemade or smuggled in from overseas (like drugs). Thanks, TS. Those seem like good suggestions. If the bill ever gets a hearing, it seems like things like that would come out in a discussion and considered. If the bill never gets a hearing, no one will ever know how it could be changed or what could be changed to make it a better bill that would be acceptable to all concerned. Things have changed since the bill was first proposed in 2007. So I think it would be wise to consider this bill given more current information we may have about terrorist activity. I do appreciate your reasoned approach to this discussion. Somewhere in these comments going back and forth for more than a year now, some of you have the impression that because I am interested in stopping prohibited people from getting guns that I must not be in favor of addressing the root causes of crime. Of course I am interested in that. But that is not what I am blogging about. Both can happen. I get the impression that you guys would just love it if no one did anything about the guns and focused on the root causes. The fact is that criminals do get their guns from many places and may, indeed, make their own. But we sure as heck can make it harder for them to get guns in the first place. I suppose they might smuggle them in. And while we make it harder for criminals, we might stop some domestic abusers, repeat drug offenders, adjudicated mentally ill folks, etc. who get guns too easily. Those are the folks who account for the most shootings in this country. I am betting that those people would not be making guns or smuggling them. It's not about whether these laws will effect me personally. They won't. It's about making sure gov't abides by Constitution. We must always remember that, as much as we worry about terrorists, criminals, abusers, etc., that in the long run, history has shown again and again that the greatest threat to liberty is government. Left to their own devices, gov't will ALWAYS trend toward tyranny, and will have "common sense" reasons to do so. It's the nature of governments. The road to hell is paved with "common sense" - i.e. good intentions. "I am betting that those people would not be making guns or smuggling them." No. They'd be buying them from their friendly neighborhood dope peddler. Schemes? Hmmm. This is a clear case of domestic violence which police officers are not immune from. Obviously this officer had some problems in his marriage, with a difficult divorce and his professional life. " Jonathan Agee’s law enforcement career was tinged with controversy at least once before — in 2009, a special grand jury focused on the Franklin County Sheriff’s Office’s employment of Hunt’s teenage daughter, Ashley. Sheriff Hunt was later cleared of a misdemeanor charge of failing to keep proper records, but the grand jury’s report found that Ashley Hunt and Jonathan Agee had a relationship that “exposed her, other employees ... and members of the general public to demonstrated risk and significantly increased exposure of the department to civil liability.” [Read more about the case.]" About 70% of domestic violence deaths are due to shootings. Families and co-workers need to be more alert to problems with divorces and especially when guns are available. This officer knew how to shoot and had a gun at the ready. It is one more sad case of anger, depression, and whatever happens in difficult divorces, that should never happen but do every day. I don't get why you posted it but I would have used it as an example for why anyone who is known to be a domestic abuser should not have a gun. We don't know that from this case. And perhaps this officer was immune simply because he was a police officer so no one thought he would do anything like this. I'm sure you are trying to get me to offer a "scheme" whatever that means. Do you have a solution or a scheme in mind since you brought it up, Stew? So what's your point? I commented on it. It's a terrible tragedy and should not have happened. It was a classic domestic violence case and not a police action in the line of duty. This was a personal situation with the police officer and frankly, I had not heard about it until one of you called my attention to it. Have I heard any of you respond to the shooting in Yuma? Not a peep from the opposition on that one. Yeah Joan, but a cop is the only one you want to be authorized to carry a firearm...they're the only ones trained and responsible enough, right? You won't find that I have said that anywhere on this blog, anon. "However, the language of the bill provides ways for people to challenge a decision to prohibit a gun purchase if their name is found to be on the list. " If none of those ways can resolve the problem in a short enough time for me to take my gun home the same day as purchased, then no deal. A right delayed is a right denied.